Two new pictures showing different angles of one of the big woods, top picture show the wood with the art board base for the tops of the trees. 15 - 20mm over hang on the tree stumps. Onto this expanded polystyrene is glued after being hand shaped to make the outlines of the trees, then painted with cheep black acrylic paint, to cover up any areas missed with the foliage clumps. Bottom picture 9th tree stump from the left, shows tea leaves used to represent ivy growing up the tree trunk. (note to self must get out more). This seems a like a great way to build very pretty but structurally stable woods sections. It is not clear from your descriptions if the tree tops are left detachable or not. 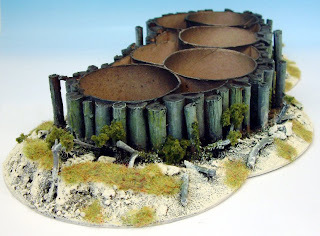 If they were, the forest terrain could be used to store other smaller pieces of tabletop terrain. Hi Eli, Good idea, the more storage the better. But no my tree tops are Glued to the art board, which is its self Hot glued to the tops of the toilet roll/twigs. 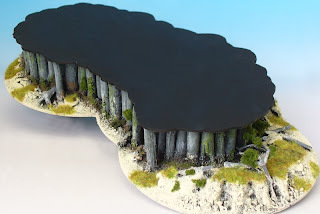 Wanna see the whole set finish as it is really an amazing idea to build big sets of woods. Hi TiYo, thanks for commenting, I use Woodlands Scenics - Bushes Forest green/Medium green. Will pos more pictures when I finish them. Just came across this site and think that you do a great job. I have a couple of questions about your "Big Woods". How do you attach the foilage clumps to the base card; PVA, hot glue gun or something else? Secondly how do you prevent the clumps from falling apart from the handling they get?